You thought you were gonna score. But she (or he) had different ideas. So now you’re all by yourself, with only a bouquet of roses and a box of condos for consolation. But wait. Don’t let those prophylactics go to waste because they can be used in many more interesting ways. Let’s start with the obvious — water balloons. Condoms make great water balloons because they hold huge amounts of water. 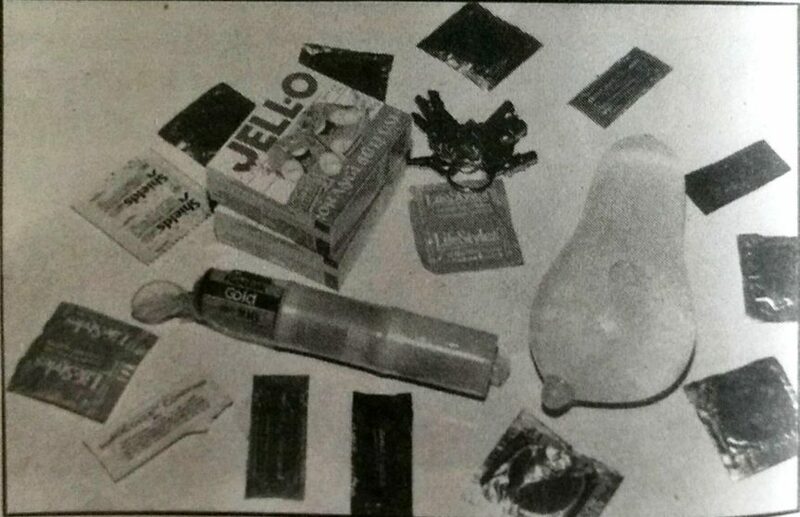 Condoms can also be filled with other fluids. You can use one as a jello mold to make interesting shapes. Or fill one with fruit juice, shove a popsicle stick in the open end, and put it in the freezer to make a condom-sicle. Omit the popsicle stick to make condom freezies, great for those hot summer days. Condoms also have many practical uses. If you need to protect small, sensitive items such as film, microchips and batteries from water, tie them up in a rubber. Or cut them out the middle while it’s still rolled up and use it as an elastic band. Condoms are also a traveller’s best friend because they hold travel-size amounts of shampoo and conditioner. Going camping? Fill a few with serving-size amounts of ketchup and mustard and woila, condiments in condoms. If you dog has just chewed up his last bone, toss him or her a few prophylactics to gnaw on. Condoms make great birdfeed holders too. From a purely decorative point of view, condoms can be used as jewellery. Condom bracelets, condom earrings, condom necklaces — the possibilities are endless. Put one on your keychain and you’ve got a condom key-fob. And if you’ve run out of sane ideas, you can get really crazy. Bored by the same old drinking games? Try using a condom for a shot glass. Fresh out of chewing gum? Try a rubber instead. If you’re into homemade foods, try using condoms as sausage casings. Mmmmm…condom-dogs. Can’t afford to go bungee jumping? Just tie a whole bunch of prophylactics together and you’ve got your own makeshift bungee cord. Need extra tuition money? Work as a drug smuggler. Fill a few condoms with drugs, swallow them and puke them back up after you’ve crossed the border. Just make sure they don’t burt in your stomach or you’re in for the high of your life and death.